My poem "Elegy for Paul Winchell" is featured right now on the Northern Poetry Review website. To learn more about the multi-talented subject of my poem (pictured with his dummies Jerry Mahoney and Knucklehead Smiff), please visit his website here. And while you're at it, check out what else NPR has to offer. For the last few years, literary blogger Alex Good has been staging The Runaway Jury, a mock jury to put the actual Governor General's jury to the test. This year Alex's jury consisted of Alex, Carmine Starnino, and myself. We put this year's poetry nominees through our own critical paces. To see what we had to say about the short-listed collections by Dennis Lee, Rob Winger, Brian Henderson, Margaret Atwood, and winner Don Domanski, just click here. Robert Potts weighs in on the Muldoon situation in the Guardian Unlimited's books blog, and he even plugs my blog while he's at it! So read what Potts has to say about things, and then when you get to the part that says (in reference to a cute story I wrote about back in March), "An even-handed account of this spat, pointing out the various vested interests on all sides, appears here," you can click back here for more of my unsolicited opinions. Okay, maybe that's a bit of an overstatement, but Alice Quinn's 20-year tenure as The New Yorker's poetry editor has, in the opinion of this reader, been characterized largely by a penchant for poems that manage to be both staid and trite. Or as the poet and critic David Orr has put it, the typical New Yorker poem has come to be regarded as "an epiphany-centered lyric heavy on words like 'water' and 'light.'" It's a formula that gets old very quickly, even in the pages of America's self-proclaimed best magazine. My guess is that Remnick is just saying that to be nice. I hope so, at least. James Fenton foresees a day when poetry readings will need directors, producers, rehearsals, and that's not all. He also wants the poets to act more professional, too. No more going over your alotted time. No more decided what to read only after you take the stage. (You know who you are). And he thinks there are limits on how a poet ought to "perform" a poem. And I am with him wholeheartedly on that point. Read on. We do not, for instance, dramatise the emotional events of a poem as if they were unfolding before the eyes of the audience. We have written the poem. Now we are reading or reciting it. Something about our manner should never forget that we are in front of an audience, presenting something we have written. We may become emotional, but not to the extent of - say - slobbering and weeping and wiping our noses on our sleeves. We may be exuberant and spontaneous, but not to the point of spontaneous combustion. Certain tricks of the radio actor's voice are forbidden to us - funny little gargling sounds or strictures of the windpipe, conventional ways of signalling that there's an emotional passage coming up. We don't like these vocal athletics anyway, when we hear actors reading poems, and we like it even less when we witness other poets moving in that direction. I chose to quote this passage from the article because it's true, and it's a pet peeve of mine. I can't stand to hear actors reading other people's poems. That's because actors have a tendency to act poems rather than read them. Every time I have heard a professional actor read a poem, say, at an awards ceremony because the actual poet couldn't make it, the result has been a bombastic, Pollyanna massacre of the poem. If a poet can't make it, please don't bring in an actor to recite the work. There are probably any number of poets in the audience who can read the honouree's work just as well, if not better. Most likely better. And why not listen to James Fenton read his own work? Even if he tends to emphasize form over content when he reads, you might learn something. There is at least one book of high-quality poetry about the Iraq war. Here, Bullet is a collection of 50 poems by an American soldier, Brian Turner, published by a small firm based in Maine, Alice James Books. It is populated by the dead and the near-dead, "the ghosts of American soldiers", the bodies of Iraqi policemen, the vultures overhead to whom one day might be offered "my life / a gift of heat and steam". Turner served for seven years in the US Army, first in Bosnia, then in Iraq as a team leader with the 3rd Stryker Brigade Combat Team, 2nd Infantry Division. The poems in Here, Bullet, inspired by the latter experience, are steeped in pity for the occupants of Iraq, while at the same time remaining on full alert to the likely moment "when a twelve-year-old / rolls a grenade into the room". After a murderous market-place explosion, "Allah must wander in the crowd / as, I do, dazed ..."
Read the whole article in The Guardian. Get more information about Brian Turner's Here, Bullet. Click here to read some poems from the book. The title poem is especially wonderful. Robert Bly called Alden Nowlan the greatest Canadian poet of the twentieth century, and time might very well prove him right, so the question must be asked, almost 25 years after the Nowlan’s death, why has there never been a comprehensive edition of his collected poems? When I first took on the responsibility of being poetry editor for Insomniac Press in 2001, I ambitiously set out to bring such a book into existence. After asking around, I learned that Ross Leckie was already preparing Nowlan’s collected poems for Goose Lane Editions. Shortly thereafter, Leckie contacted me to ask if I had bought the rights to the project out from under his nose. I hadn’t, of course, but it seems that someone had. The Goose Lane project had to be scuttled because the rights were unavailable, but neither of us knew who was withholding the rights. The book and the mystery both ended there. No one came forward to claim responsibility, and while I have waited for this essential book to appear, nothing has come of it. Despite the lack of a proper collected poems, Nowlan’s international reputation as a poet of the first rank continues to grow. That someone out there is purposefully preventing his collected poems from being published is nothing short of an abject transgression against literature. So, where is the Collected Poems of Alden Nowlan? Who is responsible for keeping this book from coming into existence? And what good reason could there possibly be for suppressing Nowlan’s rightful literary legacy? I, and many others, would like to know. More importantly, we want the book. As a lover of poetry, I always feel a deep gloom sinking on to me at the approach of National Poetry Day. Oh god, I think. There's going to be a lot of press releases. There's going to be an attempt to make poetry relevant and fun, by making it less like poetry. There's going to be… oh god. This year, it's Bob Dylan. Children at key stages three and four English are going to be instructed to study the great man's work with the aid of a special "Dylan Education Pack", issued in honour of National Poetry Day. In my mind and the minds of most people who give serious attention to his work as a lyricist, Dylan is a genius. But he's a songwriter, not a poet. It doesn't elevate his work to call it poetry any more than it elevates an apple to call it an orange; nor does it give you a useful way of thinking about it academically. Some rock and pop lyrics, Dylan's among them, work as poetry - live differently, but also well, on the page. You'd expect that. Poetry and song - as the two main rhythmic uses of language - have the same origins and much in common. But that's not to say they're the same thing. We share an ancestor with the chimpanzee, and we both like bananas, but we're not the same creature. Sorry, kids. It needed to be said. Read the whole story here. Roberto Benigni is touring Italy with a new show. In it, he recites passages from Dante's The Divine Comedy and offers his own political satire in-between recitations. So desperate was one man to hear Benigni 's recital, that he shot a security guard five times in the leg when the guard tried to prevent the man from entering the piazza without a ticket. And around the world, living poets can only dream of being so popular. SOME people have faces which are just naturally funny. When Michael Rosen starts to perform one of his much-loved poems for children, his eyes bulge with excitement and his mouth spreads into a broad grin with a big ear on either end. It's the kind of face which made him Quentin Blake's model for the BFG. The kind of face you warm to. It's now the new face of children's literature, since Rosen was appointed Children's Laureate in June. The two-year appointment, previously held by the likes of Michael Morpurgo and Jacqueline Wilson, aims to raise the profile of writing for children. Rosen, 61, is the fifth Laureate, and the first poet to hold the position. Each Laureate is given the opportunity to advance projects of their own, and Rosen is bursting with ideas. Over coffee in a greasy spoon near his home in Hackney, he enthuses about a YouTube-type interactive website for performance poets, a children's poetry roadshow, literature trails, poetry-friendly classrooms and a prize for the funniest children's book of the year. He's got two years and the clock is ticking. No point hanging about. There is a sense in which the Laureateship has simply given a formal shape to what Rosen has been doing for 30 years. Donald Hall, the nation’s poet laureate and author of 18 books of poetry in addition to books of essays and prose, provided us with our first subject. It is the New Hampshire house where he spent most of his summers growing up and where he has lived and worked since 1975, when he moved in with his wife, the poet Jane Kenyon, who died in 1995. I'm sure they meant to say "former" poet laureate. Read the entire feature here. "Thirty years ago, on September 12, 1977, Robert Lowell died of a heart attack in the back of a taxicab, on his way home to the Upper West Side from Kennedy Airport. Lowell was just 60 years old when he died, but he had already outlived most of the poets of his brilliant, afflicted generation. Delmore Schwartz, his onetime roommate, died in 1966, a paranoid recluse in a Times Square flophouse; John Berryman, his close friend and rival, committed suicide in 1972 by jumping off a bridge in Minneapolis; Randall Jarrell, his college roommate, was hit by a car in 1965, also probably a suicide; Sylvia Plath, whom he had taught at Boston University, killed herself in London in 1963. As this list shows, Lowell stood at the center of his generation in a personal as well as a literary sense. It was not just that he was the most talented poet of his time, and the most famous. For three decades, he was poetry's epicenter, and the violent tremors that radiated out from his life and work reshaped the whole landscape of American verse. Read the rest in The New York Sun. On their website the Atlantic is offering a review of Walt Whitman's Leaves of Grass that originally ran in the pages of their magazine in January 1882. 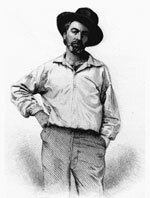 "The appearance of Walt Whitman's Leaves of Grass in a new edition has revived a discussion always imminent when the name of this writer is brought forward, and always more or less acrimonious. Some persons even imagine it obligatory upon them to deny him all merit of poetic endowment, so violent is their revolt against the offensiveness which Mr. Whitman has chosen to make a central and integral point of his literary method." "Every one imbued with the "primal sanities" must be revolted by this offense, and protest against it. Fortunately, however, the chief damage done will be to the author himself, who thus dishonors his own physical nature; for imperfect though the race is, it still remains so much purer than the stained and distorted reflection of its animalism in Leaves of Grass, that the book cannot attain to any very wide influence." I leave it to you, if you are imbued with the "primal sanities", to read the rest of the review here. One of our greatest lyrical voices is no longer with us. Margaret Avison passed away last week in Toronto at the age of 89, but it appears the story is only now being reported. A private memorial service has already been held. I will spend some time with her poems to remember her life and work in my own way. My poem "The Painted Beasts of Lascaux" has been selected to be this week's Poem of the Week by the Parliamentary Poet Laureate of Canada John Steffler. Check it out here. And you can take a virtual tour of the caves here. Collins takes some lumps from a lot of his peers for being a writer of "accessible" poetry. San Fransisco Chronicle columnist John Carroll, who admits that he is not a big reader of poetry himself, takes the time to ponder the question of accessibility, elitism, and place of Billy Collins in contemporary poetry. For the record, Collins doesn't much care for the word "accessible" either, because it suggests "ramps for poetically handicapped people." He likes the word "hospitable." But he concedes that "accessible" has won the day, and he's happy with the side he finds himself on. "Some poems talk to us; others want us to witness an act of literary experimentation." Melissa A. Barton offers her thoughts on Lucia Perillo's new book of essays I've Heard the Vultures Singing: Field Notes on Poetry, Illness, and Nature on the popular website bookslut. From the very first line of I’ve Heard the Vultures Singing: Field Notes on Poetry, Illness, and Nature it is clear that Lucia Perillo is a poet. Her prose is lyrical, sharp and rich with unusual and striking imagery and biting lines, whether she’s writing about seagulls, Emily Dickinson, or her desperate trials of alternative treatments for multiple sclerosis. Perillo, the author of four award-winning books of poetry, was a backcountry ranger before she was diagnosed with multiple sclerosis in her 30s. Since then, the disease has made her “ever more physically compromised,” which requires her to redefine her concept of wilderness so she can still experience wilderness despite being unable to walk. Thus I’ve Heard the Vultures Singing opens with Perillo’s observations of that most reviled and overlooked bird: the seagull. As Perillo learns to see seagulls, so does the reader. Wilderness can be found in unexpected places, even odd-smelling, trash-ridden, muddy docks. While seagulls aren’t as good for stories as eagles, they have their own appeal. I've recently finished reading this, and I thought it was marvellous. One thing I found remarkable about these essays was how effortlessly Perillo incorporates discussion of poetry into her memoir of illness and nature. All her themes coexist organically with one another and nothing ever feels like it's been parachuted into the scene. For Perillo, poetry is a natural part of life, as present in the world as seagulls and illness, and often much more pleasant. For the whole review please click here. Well, I'm off to Berlin for the poetry festival. It's a fantastic opportunity, and I'll be filing a full report upon my return. Check out the program of events here. As a poet, Hamburger certainly had no cause to feel inadequate, though he was a surprising omission from many anthologies of mid-20th-century verse. It was surprising because his work had nothing in it to offend the sensibilities of the custodians of received wisdom and, though markedly intellectual at points, had no obscurantism in its language. On the whole, his work was characterised by an unsentimental integrity and he was particularly evocative in his reflections on nature. But if he had been neglected as a poet, it was his distinction as a critic, a teacher and, above all, as a translator, rather than any hostility toward his verse, which was the cause. Hamburger translated fluently and widely from both French and German writers, though his greatest achievement was generally considered to be his translations of H?lderlin, which brought the poet to a wider audience. Michael Hamburger in The Poetry Archive. Host Scott Griffin began the proceedings with a speech about the importance of poetry, and presented The Lifetime Recognition Award to legendary poet Tomas Transtr?mer. The Swedish poet, who was in attendance with his wife, Monica, has been translated into English more than any poet in the world, and is often called one of our greatest living poets. Transtr?mer’s work was read in Swedish by Monica Transtr?mer, and in translation by Griffin Trustee Robin Robertson. Trustee Robert Hass paid tribute with a moving speech about the poet’s career; glasses were raised. Later in the evening, Canadian winner Don McKay cited Tomas as “the most important poet” in his life. I am huge admirer of the poet Rodney Jones, and last night I had the very good fortune to see him give a reading as part of the Griffin Prize readings. He was tremendous, and the crowd seemed to love him. Paul Farley, a young British poet, also knocked my socks off. I will be reading him for years to come. Together Jones and Farley would have made an utterly memorable reading (which, it should be noted, is a very rare thing), but the stage was stocked overfull with some the greatest literary talent the poetry world has to offer. Charles Simic, one of the judges of this year's Griffin Prize and a winner in 2005, was there. I have been reading his work with delight since I was twenty. Don McKay, one of my Canadian heroes, gave an excellent reading. This is his third time being nominated in the seven year history of the Prize. Charles Wright was beyond charming. John Burnside, a large man with a large voice, was a presence at once imposing and disarming. Watching him unfold several scraps of crumpled notes in order to introduce Ken Babstock was nothing short of cute. The usually reclusive Frederick Seidel remained reclusive, it seemed, and a young actress (who's name I didn't recognize or retain) was hired to read poems from his book Ooga Booga. Though it was no fault of hers, I think it was a bad choice. As actors are want to do when reading poetry, she over did it. And Seidel's poems require subtlety. She had warned the audience that she was going to try to "inhabit" Seidel's words. And she did so, but I fear she may have had to first evict the consciousness that wrote them. She rendered Seidel's black, deadpan humour with too much of a smile, in my opinion. It seemed wrong. It felt uncomfortably sunny. Still, her effort was sincere, and I applaud her for that, and the poems are excellent regardless. You'd think a more impressive line-up would be difficult to assemble. But add to all this Karen Solie, another judge and herself a past Griffin nominee not to mention one of the finest Canadian poets of her generation, and nominee Priscila Uppal. What could you possibly want to add to such an already wonderful mixed bag of talents? Enter Scott Griffin, the illustrious founder of the feast. The time had come to award a senior poet with the Griffin Lifetime Achievement Award. This award, begun last year when Robin Blaser received the inaugural honour, is an initiative of the trustees of the Griffin Prize and completely separate from the judges and the nominees. Scott introduced Robert Hass to present the award. When Hass got behind the microphone, he said, "Tomas Transtr?mer. . . " and for several moments the rest of his words were the aural equivalent of a blur. An audible gasp rose the audience. Excited whispers flew. In the wings, I could see the shape of a man sitting a wheelchair. He was actually there. Transtr?mer (pictured) was brought on stage to thunderous applause and a standing ovation that last several minutes. He is a true legend, someone who's name will live on through the ages when all our athletes and politicians are long forgotten. He lays more claim to literary posterity than perhaps any writer of poetry alive today. After he was presented with his prize, his wife Monica read a poem of his, "Couples," in Swedish. Such beauty, it made me want to learn the language on the spot. Griffin trustee Robin Robertson followed with an English version of the same. I was moved, to say the least, and still somewhat stunned to be in the same room with a man who's talent I consider to be larger than life. In the lobby after the reading, when the crowd was milling aimlessly, I noticed Transtr?mer sitting near me, and he was not yet surrounded by a throng of admirers. I offered my hand and spoke to him. What I said is not important. It was nothing special or original. His response was a simple smile, genuine, pleased, reassuring. I will never forget it. Airsteram Land Yacht wins the poetry category. - RIP William Meredith, more. There's a few Canadians here, too. Including Darren Wershler-Henry, bpNichol, Paul Dutton, a.rawlings, and Christian B?k. Which is wonderful, but with theory-lovin' folks like Charles Bernstein and Kenneth Goldsmith behind this project, it's no wonder other Canadian poets, ones who write more in the mode of Donald Hall or CK Williams, are not represented. Still, it is an excellent resource to add to your collection on on-line poetry treasure troves. "C?te St. Luc unveiled Sunday the new Irving Layton Avenue, named after the late Montreal educator and poet who died in January 2006. I should probably read this book before heading to Germany for the Berlin Poetry Festival next month. I have no doubt some of the locals will ask me if I like German poetry, and I will say yes, and they will ask me who I like best, and I will say Rilke... oh, and some H?lderlin, and maybe some Goethe, and they will roll their eyes, because that's what everyone says if they don't know much about German poetry, which I don't. The seven finalists – three Canadian and four International – will be invited to read in Toronto at the MacMillan Theatre on Tuesday, June 5, 2007. The winners, who each receive C$50,000, will be announced on Wednesday, June 6, 2007 at the seventh annual Griffin Poetry Prize Awards Evening. Read the press release.